Winning isn't easy. The world is becoming more and more competitive, with a greater need than ever for people to work together effectively in teams to make organizations successful. There is no better model for success in business than the world of sport, with its bottom-line performance culture and its relentless focus on creating winning teams. 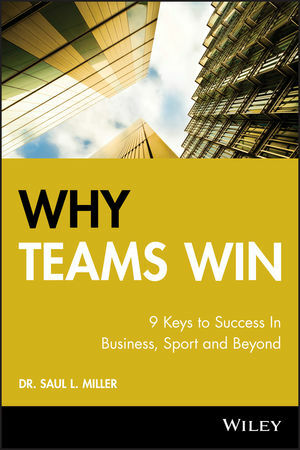 In Why Teams Win, renowned sports psychologist Dr. Saul L. Miller-the man who teaches elite athletes and top sports teams how to be successful-uses sport as a powerful metaphor for the world of business. Identified the 9 key characteristics of successful teams. Describes how to improve personal, organizational, and team performance in each of these 9 areas. Explains how and why to apply different strategies to different types of teams. Outlines how to balance the needs of the individual with the needs of the team. Helps people work together and perform to the best of their abilities. Shows how to get the maximum potential out of a group of individuals. Features advice, quotes, and interviews from high-profile athletes and coaches, as well as from business leaders. Includes self-evaluation and team-building exercises. Why Teams Win offers anyone wanting to improve their personal and team performance a proven and accessible formula for success.